Millcreek Herbs LLC - Herb Articles - In Case of Emergency - Dedicated to the understanding, wise use and enjoyment of herbs. Merry's articles and herbs research will help you to learn more about medicinal herbs, culinary herbs and the wellness benefits of Complimentary Alternative Medicine (CAM). I have never considered myself a survivalist and I'll bet most of the battered folks displaced by the violent destruction of hurricane Katrina had not previously thought of themselves as survivalists either. Now they do. They have earned that badge of distinction not by barricading themselves in remote locations with guns and ammo, but by living through the hurricane only to be faced with the ordeal of staying alive for days without food, clean water, sanitation, shelter, medicine, safety or information that could give them hope that help was on its way. As if the initial shock of the tragedy, harm, devastation and loss of life were not enough, a couple of days after the disaster, reports began to circulate that the death toll would rise significantly because of problems that result when help can't arrive. Injuries fester, bodies weaken from dehydration and lack of nourishment, susceptibility to disease increases as pollution rises and lack of shelters make protection from the elements impossible. Add despair to this toxic mix and recovery hardly seems possible. The victims cannot very well help themselves. Or can they? We could all find ourselves in circumstances this desperate if the big earthquake happens in Utah as predicted. In imagining what help there might be until the well-trained, well-equipped, life-flight variety can arrive on the scene, it occurred to me that we are surrounded by plants of great medicinal value. Your medicine cabinet may be buried in the rubble. 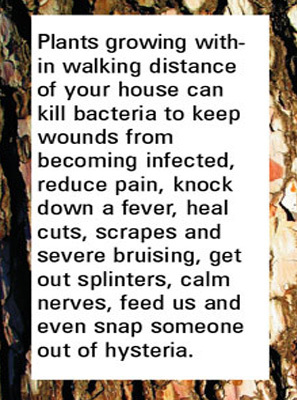 But plants growing within walking distance of your house can kill bacteria to keep wounds from becoming infected, reduce pain, knock down a fever, heal cuts, scrapes and severe bruising, get out splinters, calm nerves, feed us and even snap someone out of hysteria. The trick is to know what plant does what. Many herbs have water soluable constituents and don't require heat to process. Everyone has Oregon grape (Mahonia) close by, and if it is not in your yard it grows in abundance in the foothills. The roots of this plant will not only kill germs on the outside, but also the inside. When combined with the bark of scrub oak, it will relieve dysentery brought on by bad water or food. I would use it to help kill germs in water, too. If you cut yourself: Pine sap stops bleeding. Willows grow near moist areas and a tea of its bark will reduce pain because it contains salicylic acid which is what aspirin is made out of. Arnica grows in the mountains. Arnica preparations can be made from leaves, flowers and roots. It can be used topically on sprains and bruises to reduce swelling and pain. Yarrow and plantain, used topically, will heal wounds and decrease the itching of insect bites. Echinacea (gardeners often call it purple coneflower) is a famous healer. You can nibble fresh flowers in the summer or use leaves flower and root to make a "whole plant" tincture. In cases of smoke or toxic fumes inhalation, mullein leaf and native mallow roots will sooth sore throats. Elder flower and balsam root should be used if people start getting colds and flu. Dandelion leaves and roots can be eaten and are super nutritious so will help restore lost nutrients. Know where your plants are! For instance, if you have echinacea in the garden, you can dig up the root even in the winter and chop it up, then soak it in water for a few hours. Or you could chew on a cleaned root. You can also dig up and eat roots and bulbs of plants like garlic, chives and parsley. My wake-up call to begin thinking about this seriously came when my family lost power for four days during the coldest part of winter two years ago. After the tsunami, I could see the coastal regions were demolished, but I knew higher up there were certainly plants in gardens and in the wild that could be useful to the people. I hoped that those who knew how to use them were able to help. I know the same is true in the Gulf Coast region now. Understanding what great potential there is in plants to help manage and relieve such a threatening situation, I enrolled in the Community Emergency Response Team (CERT) training which teaches people how to be first responders in their neighborhoods. I think it should be taught in schools. It offers basic information on how to go about taking care of yourself, your family and your community in an organized way that will assist the professionals once they can get there. This is good information to have. In addition, knowing how to use the healing plants in our own back yards could be our saving grace in such a catastrophe.